When I first got interested in sailing canoes I was desperate to see as many different boats and ways of setting up a canoes as possible .With that in mind may I humbly suggest a thread showing the different types of sailing canoes forum members own? I own 2 sailing canoes. The first is a 17 foot Grumman, A beautiful American canoe, if not for the aesthetics then because of the heritage. 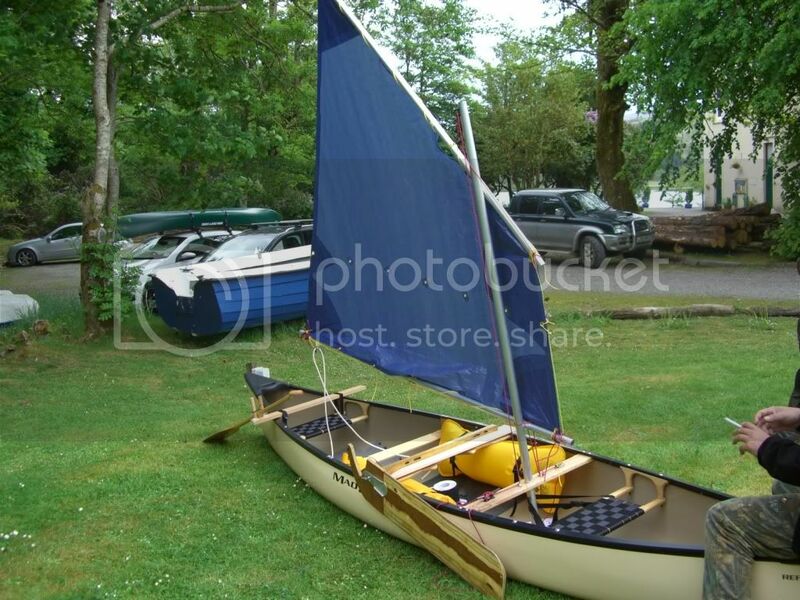 The sail is hand made balanced lug made from polytarp, as are all the fittings and mast, except the Leeboard thwart.Almost everything bolts onto the canoe, and is removable,the only permanent fittings are the mast foot and rudder fittings. its a bit of a dog sailing into the wind on the tack that has the sail against the mast. I am also lucky enough to own a Solway-Dory Curlew, a 14 ft canoe with Bermuda rig this at one time was the demo boat for SD and has travelled to Scandinavia so I believe (although not sailed directly there I expect!) Sailing into the wind and against the tide has been a revelation! Great stuff.....I'm going to be fitting out one of my boats, but, I want up wind performance without changing the boat too much? One's already operational: our Jensen 18 goes like a rocket with the Solway Dory 44 square foot bermudan rig and a former OCSG member's old leeboard and rudder. Solway Dory Shearwater with SD outriggers. 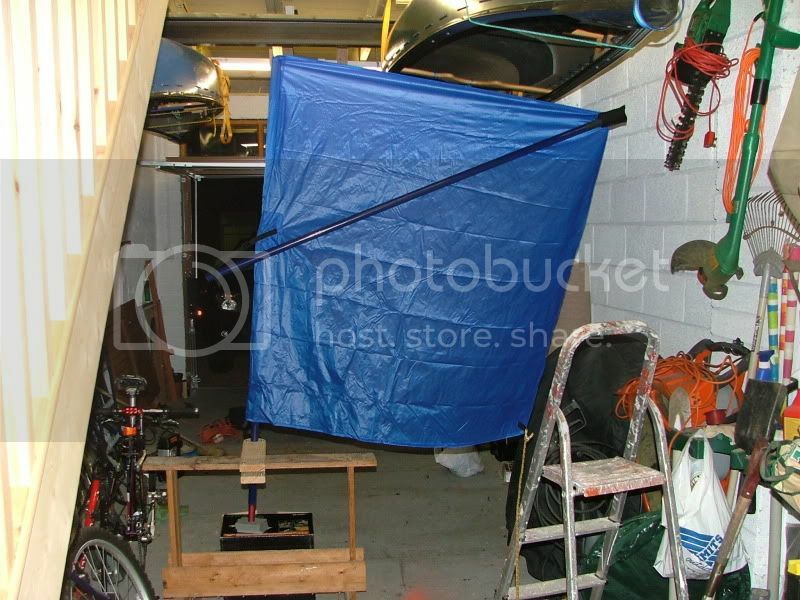 I mainly use a 5m2 SD Bermudan Rig, but occasionally use a smaller 44sqft SD Bermudan Rig. This is my seventh (!) sailing canoe. 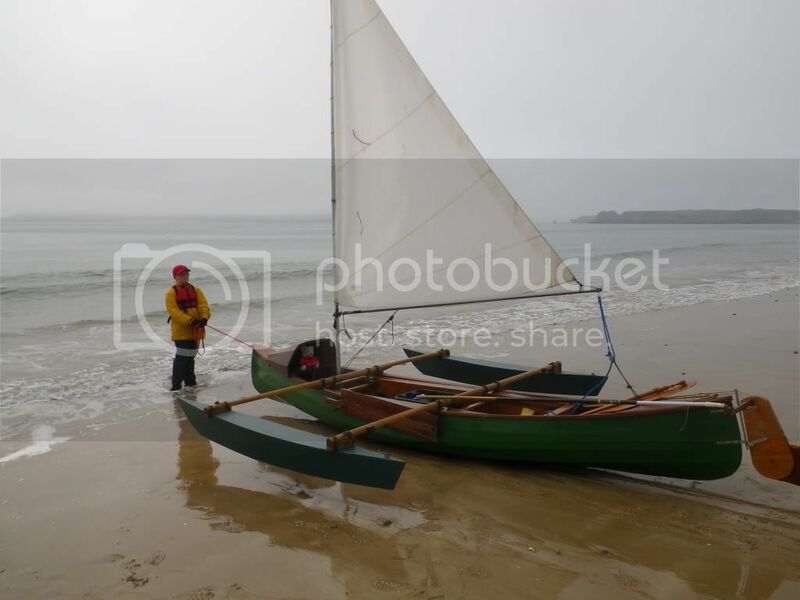 I've previously owned Polyethene, Royalex and GRP open boats set up for sailing, a plywood decked boat and two trimarans style outrigger boats. I've settled on the decked GRP Shearwater because it offers a compromise between the sea worthiness of the trimaran style outrigger canoes, and the maneuverability (on and off the water) of the plywood decked boat. 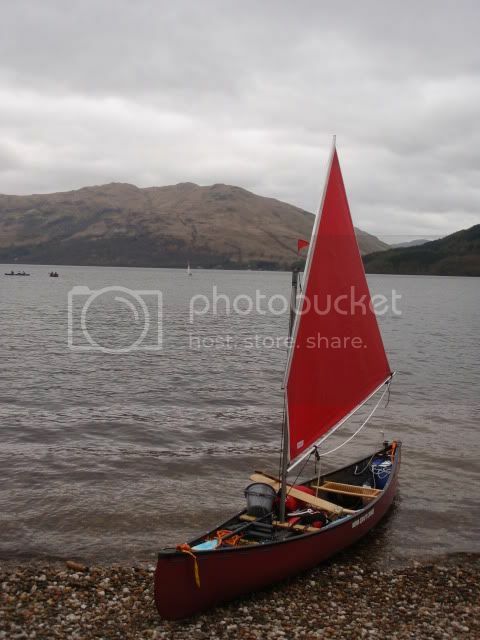 I use it for expedition sailing on the west coast of Scotland and for inland sailing - I have no plans to get another boat! 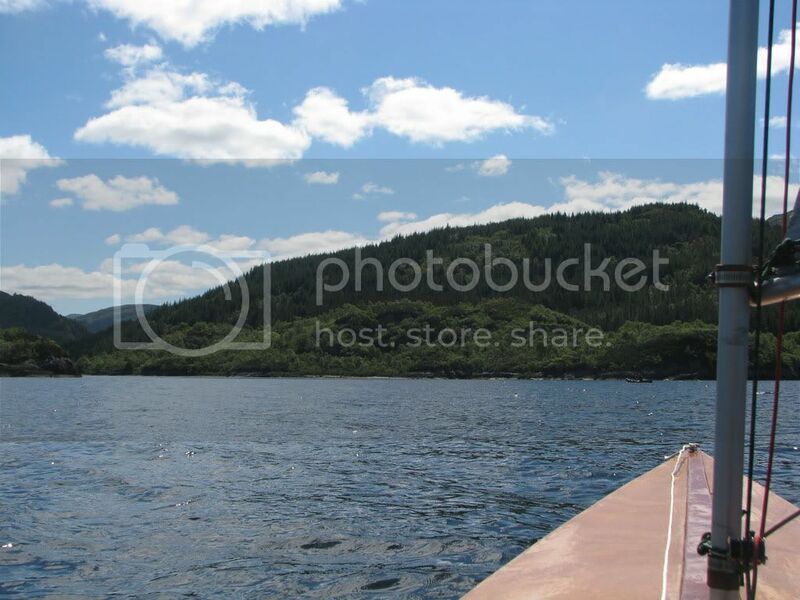 The boat is quite wide and has decks, so it doesn't paddle as well as an open boat with a single bladed paddle, but it paddles just as well as an open boat when used with a 240cm double paddle. I've spent a long time perfecting paddling an open boat with a single bladed paddle, but I find double bladed paddles more efficient when going in a straight line for any distance, regardless of whether I'm in a decked or an open boat. I am on my third sailing canoe. First was a SD Curlew which I adored. So well resolved, easy to sail, I was really spoilt with her, and only sold her because I wanted a decked sailing canoe for Solent sailing. 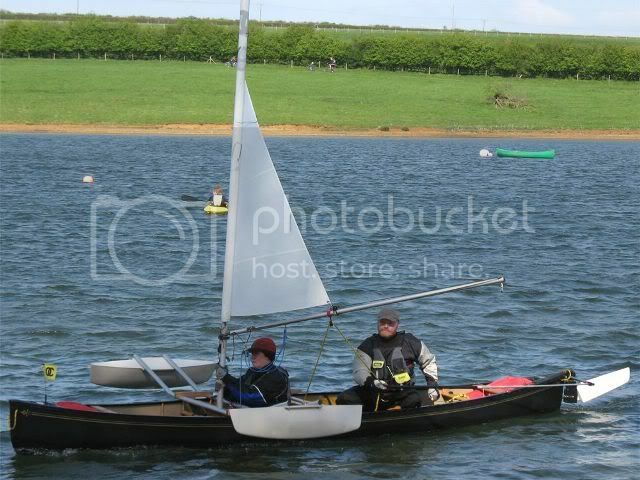 So I now own a SD Shearwater decked sailing canoe with outriggers for sea sailing. She is a superb boat, a joy to sail and just so responsive. Here is a video of my very first outing in her. 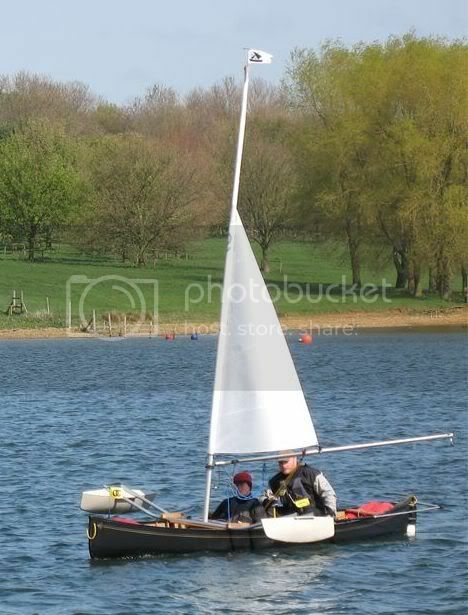 I had gone out to watch the dinghy racing and a friend on support boat had a camera with him. These boat as so smooth they don't look to be moving quickly but note at about 45 secs in the wind fills in a bit, you can here the RIB engine and wash and judge the speed. The rig here is a 4 sq mt which I have now swapped for a 5 sq m.
Last edited by keyhavenpotterer; 7th-February-2011 at 10:18 AM. My second sailing canoe. 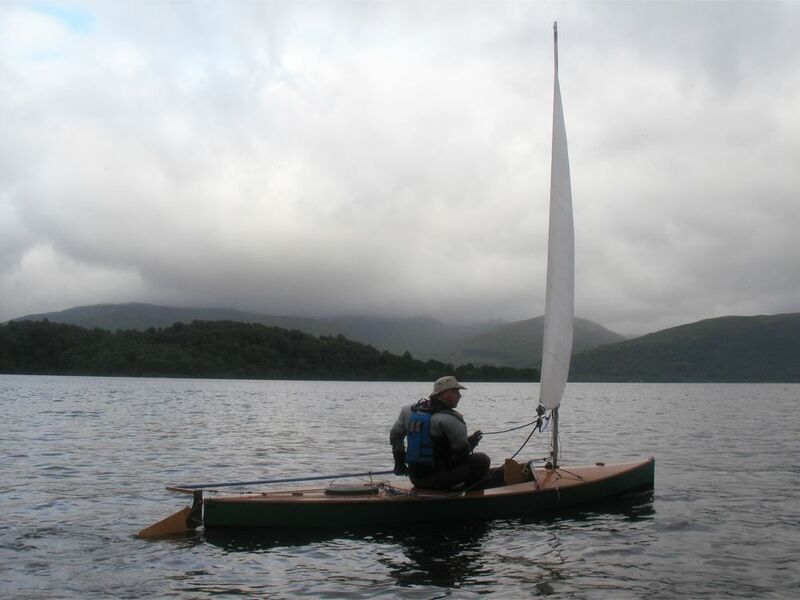 A Solway Dory plywood decked canoe, 44sqft SD Bermudan Rig. Last edited by Chainsaw; 21st-April-2011 at 10:43 AM. I've since added a removable leeboard bracket and a proper rudder. Haven't tried them yet. 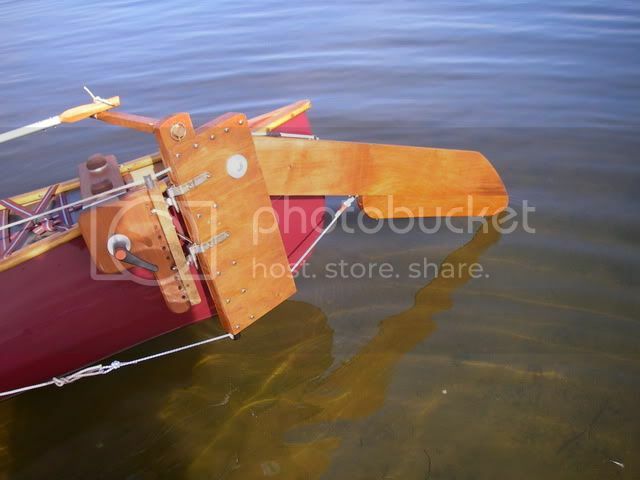 My next version will be a bat wing gunter rig of about 4 sq M.
Great to see all these boats! 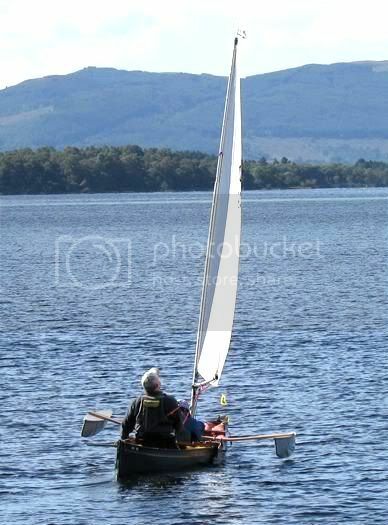 I haven't got my sailing rig yet but my cheque is in the post to Solway Dory as I type this. I'll post pics as soon as I have it all up and sailing (can't wait). Those Shearwaters look so good, maybe if I manage to sell my motorbike I'll get one. Ho hum. Here's my canoe at Tenby - just about to sail to Caldy Island with my son. My canoe is a Selway Fisher Prospector (but a very heavy version!). However, she seems to be quite sea-worthy anyway and a real joy to sail. The rudder and spars were scavanged from an old, small beach cat. The rest was home made. Here she is with another canoe, a self made stripper with a Todd Bradshaw made sail! This is Pilgrim on her first sail. Whilst putting her together I have take pains to avoid modifying the canoe, with all the sailing bits removed only the mast foot and two holes in the yoke are visible. That looks great Paul, I'm aiming to achieve something similar myself (albeit with a less performance orientated rig and without the outriggers to start with). Any chance you could post some pics of rudder Mk 2 when you get it finished and tested? (I'm seeking inspiration in the rudder department although I do have a few ideas already). Will do Chris, should be in photographable form in next couple of days. 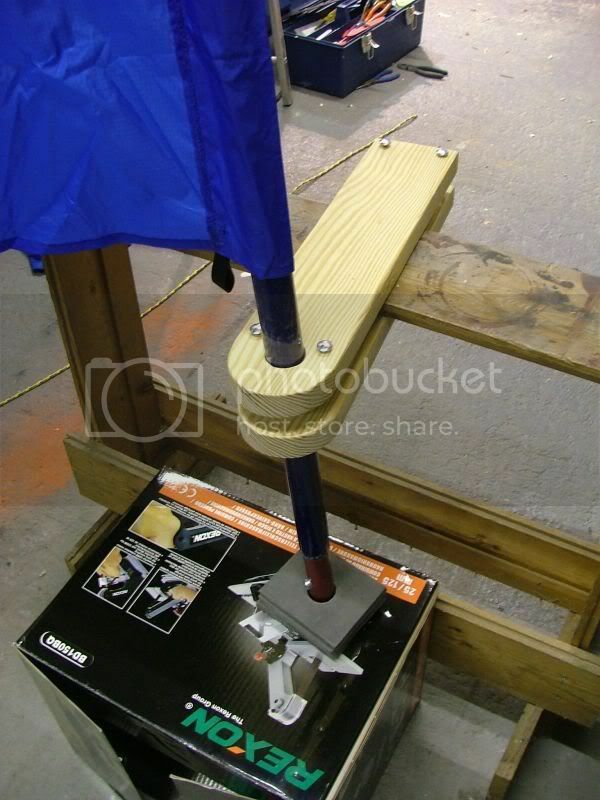 I like Pilgrim's setup Pudseypaul, nice and simple and still preserving the canoe for its other uses. 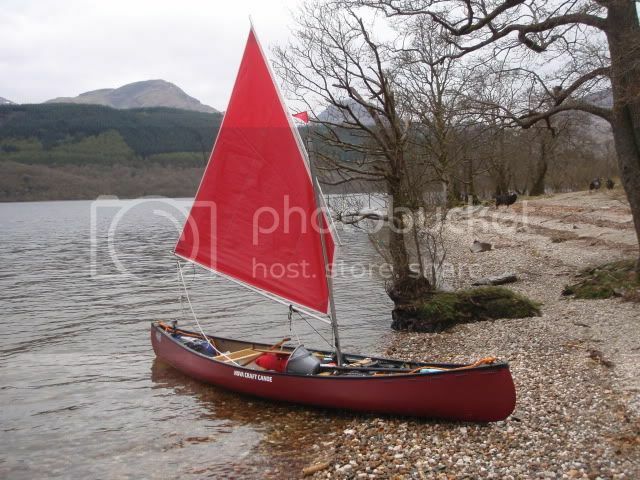 I've had a few of Solway Dory's designs but the open canoe conversion is by far the best, as with a little bit of dismantling the open canoe can be easily converted back to a flat or whitewater boat. 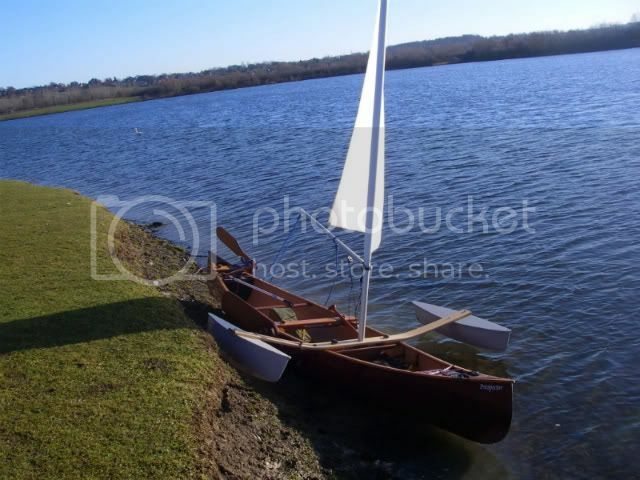 My present saing canoe is the prospector with the only concession to permanent fixtures being the rudder fitting and the mast thwart, very similar in fact to your boat Pudseypaul. The decked canoes such as the Shearwater are very seaworthy and efficent sailing machines but that's really where they're designed to sail., coastal and large inland lakes. I wouldn't like to paddle them down the tweed. No, I want one all round boat and the open canoe does that very well. It's an Old Town Penobscot 186 - so quite a large canoe and great for its capacity especially when there's two of us and we're camping from the boat. 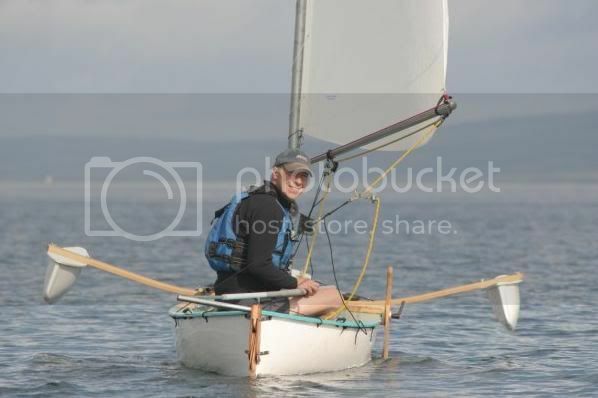 I've rigged it with a Solway Dory bermudan sail/spars, my own designed/built rudder and leeboard bracket. The actual leeboard is by Solway Dory. We use SD gullwing outriggers when the conditions are a bit challenging on open water, especially when going coastal. It has short end airbags and sidebags - essential for providing enough freeboard for bailing out after capsize recovery. The chance of capsize is remote when using the outriggers. 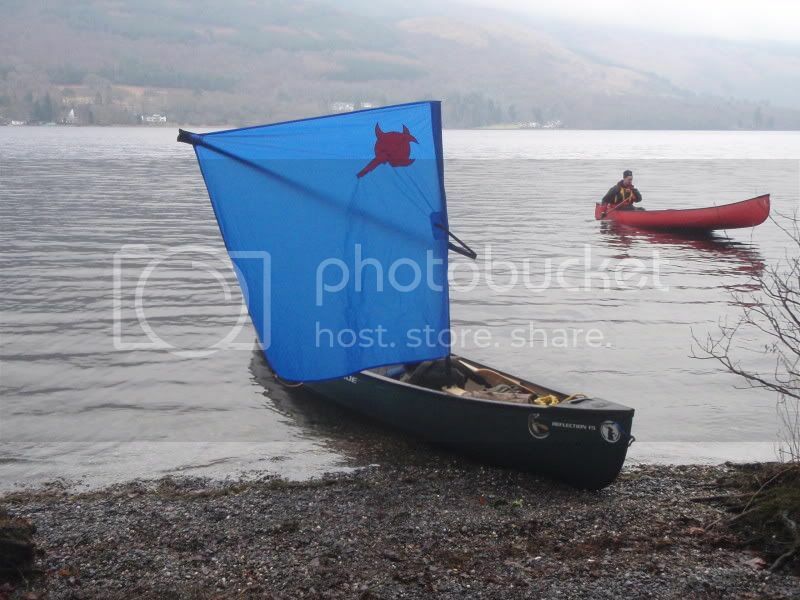 I have sometimes used a "batwing" mizzen to add sail area and versatility, but I'm going off the idea as it's a bit more faff and the bermudan is easy to reef on the move and in control - the mizzen was useful on my previous canoe that had a standing lugsail and took a bit longer to reef; a mizzen can keep the boat heading into the wind for convenience in such situations. I've also played around with a spinnaker for light wind conditions. Roller-furling the sail as we approach a landing. 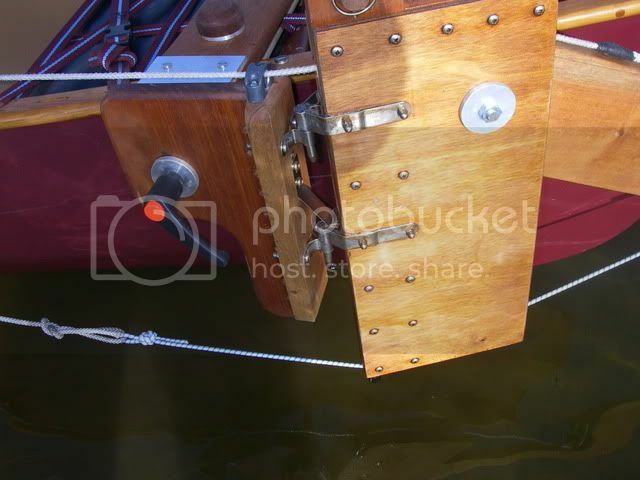 The rudder can be lifted completely clear of the water in case you need to paddle. 14' MacGregor. Roundabout a 30 sq/ft cut down sail hanging off a punting pole by a few jubilee clips and scraps of leather. Recently rigged a 15-odd sq/ft jib as well for when the wind's light and since this picture was taken it's been tweaked a fair bit - kicker strap, reefing points, pulleys for the sheet and the likes. 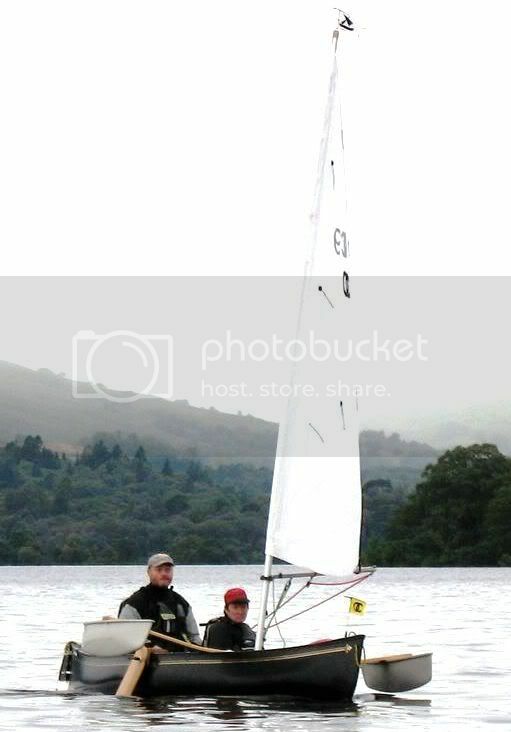 Keith, I was only yesterday admiring your canoe (I think) sailing on Windermere in 2009. There are a number of new videos on the new OCSG website. Last edited by keyhavenpotterer; 21st-February-2011 at 05:22 PM. Yes that's me, Brian - and thanks for the kind words. On the Windermere 09 video - 1.20 till 2.20 and 3.40 till the end. And a few glimpses during the Solent 10 one, too. 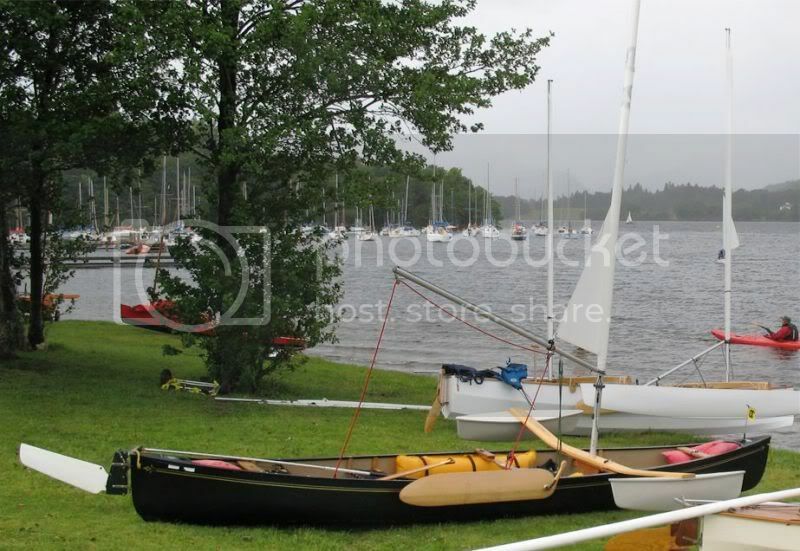 Keith, I was only yesterday admiring your canoe (I think) sailing on Windermere in 2009. There are a number of new viseos on the new OCSG website. 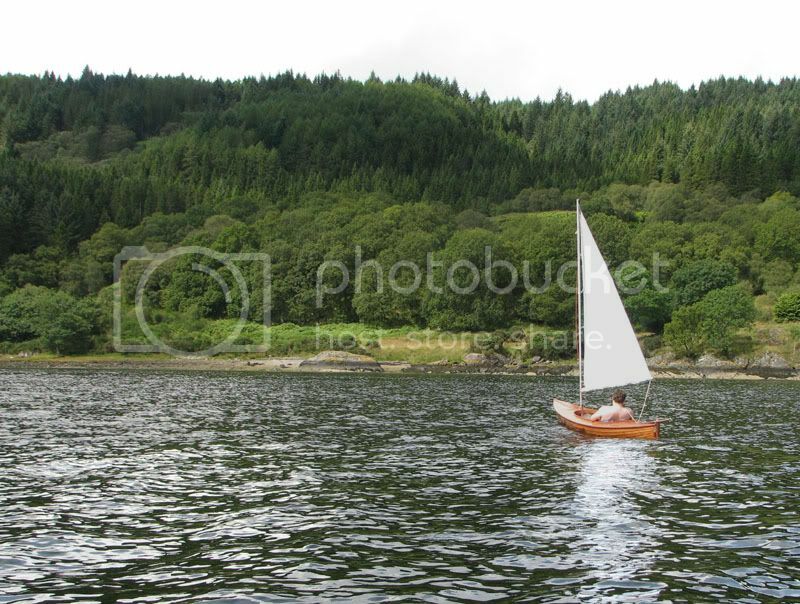 Sailing canoes look great fun as an x yacht owner i know how much fun that was. anyway this seems the best threat to ask a sailing canoe question. Does anybody have the sizes of a daggerboard.? Just thinking of another option when i get mine started. How about mast height for a 16footer. any other general parts information would be welcome. 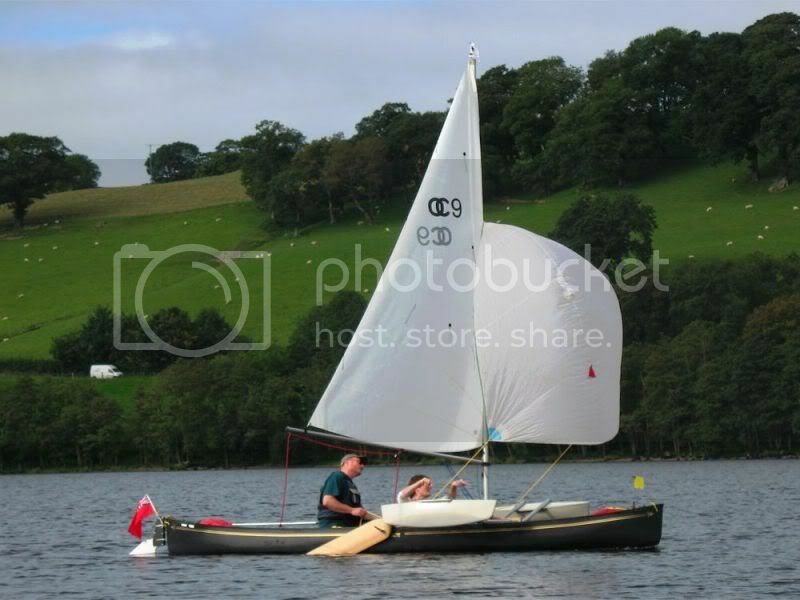 [QUOTE=Sonar;320110]Sailing canoes look great fun as an x yacht owner i know how much fun that was. Hi Sonar, Solway Dory have lots of information on Bermudan rigs, rudders and leeboards on their site. My mast for a 5m sail is 5m long, so just longer than the boat at 16'. SD leeboard is 4' long and 8" wide. 9" wide, total length 48-55" (this would include 8" handle) and 3/4" thick. His book Canoe rig the essence and the art - is great for giving you ideas - except I'm pretty cr p at woodwork . 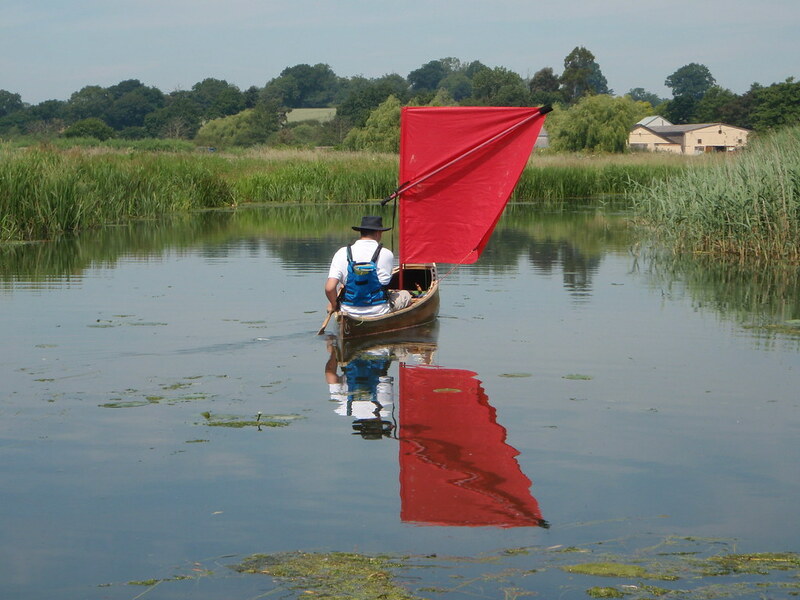 A rough rule of thumb from John Bull's little book called "Sail your Canoe" is 4% of sail area for a leeboard and 2% for the rudder - but remember this is for the effective area ie that is below the waterline, so you also need to figure out how the board will be mounted and pivoted. A quick calculation for my 5 sq metre sail provides a figure of 8" wide and 40" long. Note also that all leeboards (and rudders) should be shaped to a decent foil section, similar to an aircraft wing, so they provide the best lift when moving thro the water - but you will already know that from your sailing background, I imagine! I guess that the Solway Dory clip-on leeboard will be less effective then as I understand that this is not shaped like an aircraft wing. I suppose that everything is a trade off if you want to maintain the canoe for paddling purposes V you lean towards canoe sailing for better perfomance. I really do like your setup Keith. The Bermudan rig looks excellent and performs well judging by the video clip. Looking forward to seeing the rigs side by side at Rutland Water in April including the new Expedition rig about to be tested this week. It is the optimal profile to work on both tacks. It has a flat side facing outwards and a symetrically round side against the side of the canoe to give it lift. So not quite like a wing but still better than a plank! The rudder blade is half up to reduce drag in such light conditions. And the leeboard is too, given we are going downwind. Ok Keith, stirred into action by your picture. 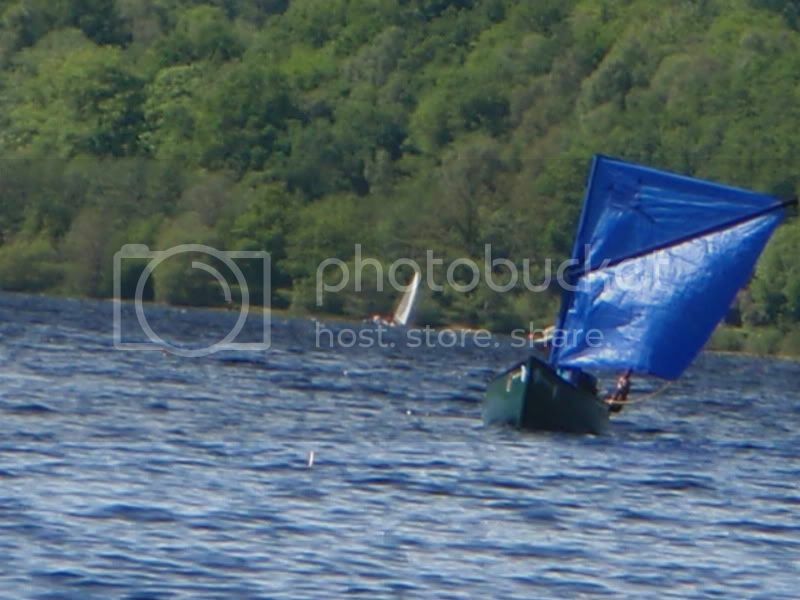 Have located a Mirror spinnaker - think my GP14 spinnaker might be overdoing it! Just checking, there is no pole, just sheeted to outriggers. Only mod is a small hole in the sail luff and a block with an eyelet riveted to the mast. What height is the halyard block from the mast foot - about 9' ? Have to disagree about the foil shape, on a leeboard fixed to one side the foil section should be symetrical, not asymetrical as an aircraft wing. But the clip-on leeboard is not fixed on one side - it's designed to be swapped over when tacking and so will always be on the leeward side. It is shaped to a compromise foil profile on the side next to the canoe but flat on the outside because it has to work going both ways. The clip-on leeboard, with its need to be swapped over, is a compromise that I suspect many more paddling-orientated canoeists will readily accept for the least bolt-on kit factor; it's also readily adjustable fore and aft to get the sailing balance right. 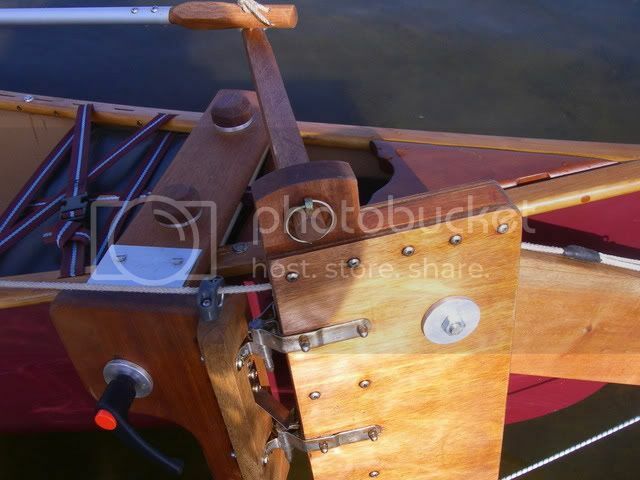 From the SD website: It is smaller than our pivoting leeboard as it is always used on the leeward side of the canoe and is designed for the smaller sail area. If you tack through the wind you need to lift it out and clip it on the other gunwale. It is the optimal profile to work on both tacks. It has a flat side facing outwards and a symetrically round side against the side of the canoe to give it lift. It is not as efficient at creating lift as our pivoting board but it is compensated by its small size and ease of stowing away when paddling. Twin asymmetrical foils have a slight advantage but the extra faff of lowering one and raising the other at each tack is not worth the extra performance offered, in my experience - I have used both twin leeboards and twin daggerboards in different canoes. I had started typing out another question earlier, but in the end decided to delete what I had written on the basis that I am a new boy around here and feel that I am already asking too many question, but someone has since raised it anyway. Here's what I don't understand and it centres around the fixed leeboard on one side of the canoe, not the clip-on leeboard. I understand that the aerofoil creates negative pressure on one side so that lift is created as it moves through the air or water. Lets now assume that we are on a starboard tack with the leeboard fixed on the starboard side, as per the right hand image below. 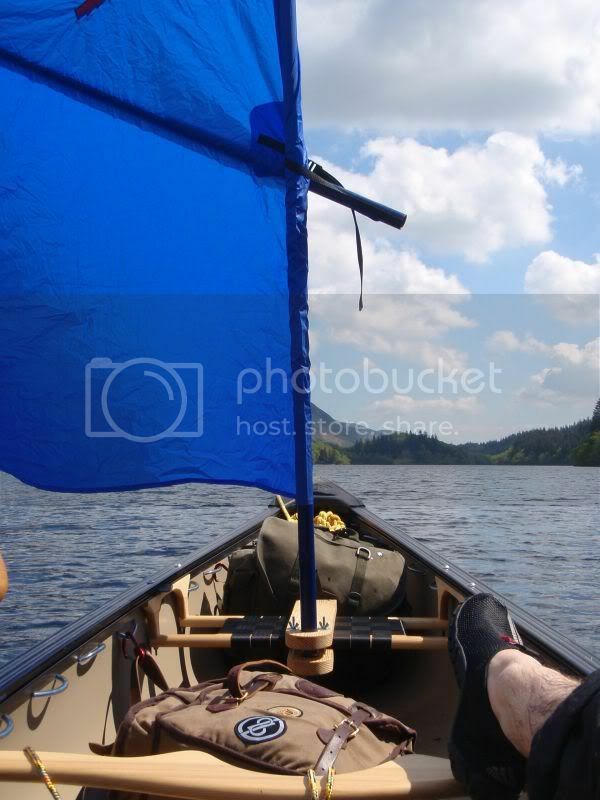 We want the leeboard to have lift that pulls the canoe to the right into wind or zero lift, but no lift that pulls the canoe to the left, down wind. On a port tack, with the same fixed leeboard on the starboard side, the opposite is true as we now want the leeboard to pull to the left, so to my mind having zero lift is the answer as these leeboards are fixed to one side of the canoe doing different jobs on different tacks! Thats the point I was trying to make (badly apparently), an aeroplane wing section (asymmetrical) will work against you, on one tack and assist on the other. A fixed leeboard requires to be symmetrical, so it works equally on either tack. Also Keith if I've read you correctly the clipped leeboard surely needs the flat to against the boat on the leeward side, so the foil is working for you, not against you, yes? you want the leeboard to oppose the force of the wind from the windward side, so it needs to create a lifting force towards the leeward side. I'm used to aerofoils going thru air, so I may be totally bonkers. Last edited by Gailainne; 22nd-February-2011 at 05:01 PM. Ok Stephen, so I'm with you on a leeboard that's fixed on one side needing to be symmetrical - I'm not aware of anyone saying it should be anything else; but it's easy for any of us to get confused in type. Last edited by windorpaddle; 22nd-February-2011 at 07:37 PM. An aeroplane wing is flattish on the bottom side and curved on the top side and it produces lift upwards, ie. from the flat to the curved. When you put the leeboard on the leeward (Downwind side) the board creates lift and holds the boat up to wind. 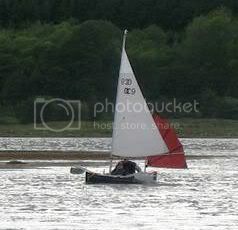 The curved side goes against the boat and lifts (pushes) the boat back upwind. With a pivoting leeboard the board is fixed on one side of the boat. Because this is the windward or leeward side, depending on which tack it is on, the board has an even curve on both sides. As the boat goes forward it makes a little leeway (it slips a bit down wind.) This gives the board a slight angle of attack and this gives it lift. The symmetrical wing shape allows it to do this without stalling and creating a lot of drag. This board has a leading edge which is a bit rounded and a sharp trailing edge and this is the low drag shape. The clip on leeboard has to change the leading and trailing edge over as you put it on the other side of the canoe for the other tack. therefore they are both a bit rounded. Ah, I do believe the mist has lifted, thanks guys. I was thinking of the wind acting on the sail, and heeling the boat, and the leeboard was an opposing force, against that pivoting action. 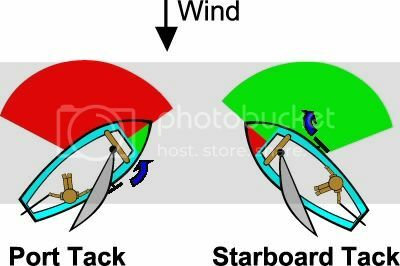 If I've got it now, any wind not from dead astern creates a sideway force, the leeboard, as the boat moves forward, creates lift to resist that sideways force, so the lifting force must be to windward, opposing the force of the wind. Agreed, GP spinnies might be a bit ambitious! I think the spin halyard block is about 10' up - can't quite remember and the rig is somewhat awkward to get at just now. Actually looking again at that photo I posted it looks higher - might be 11 or 12 ft up. It's just above the join where the top section starts so maybe the Daves can tell us the relative dimensions of the 5sqm mast sections if you need to know? Chris, pictures of Mk 2 rudder. As you can see, the engineering is strictly Fred Flintstone out of Brick Outhouse and, as can be seen from the uphaul line run, I did not take much notice of geometry/physics lessons at school!! If you or anyone else has any suggestions on improvements please offer them. The rudder was tested on a gentle wind day where it performed very well, time will provide me with stronger winds and choppier water. Thanks for posting the pictures Paul. Glad to hear the rudder worked well in trials . I've just taken delivery of the new (larger) 35sq ft SD Expedition Rig so I intend to test it (and myself ) using just a paddle to steer initially. I do have a plan in my head to make a fully removeable over the stern rudder in future so it's great to see as many different rudder designs as possible. I like the way yours pivots at the top of the rudder stock, I imagine that this will lend a lot more rigidity to the design than one pivoting lower down, good stuff! I've been waiting to get some half decent picture to post of my canoe and rig here, finally I have a couple that I quite like. It's a Nova Craft Pal with Solway Dory 35 sq ft Expedition Rig and clip on leeboard, all off the shelf stuff I know but I love my canoe and rig. 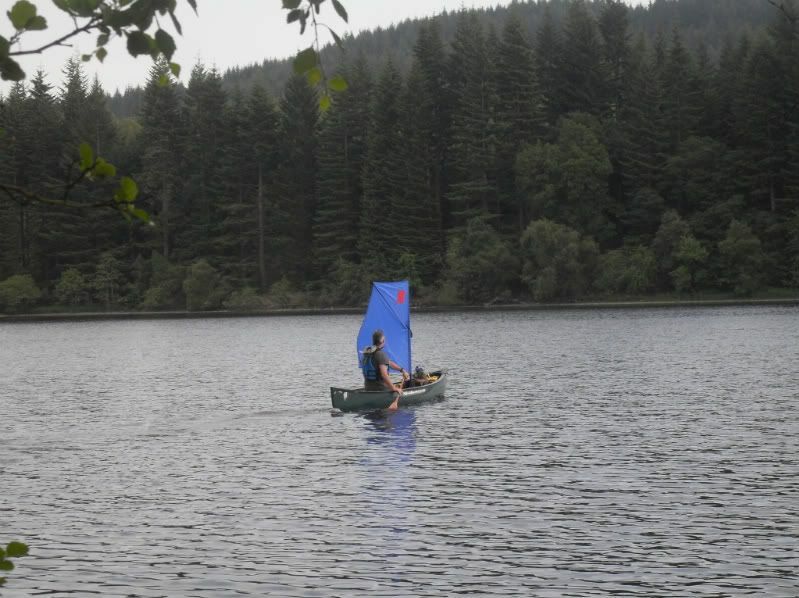 Opposite end of the spectrum from me, a set up for a paddler who likes a wee sail! Homemade thwart that bolts onto the front seat and foamy foot glued onto bottom of canoe.